Durham is a small city in the northeast of England that was largely forgotten by the Industrial Revolution. The city is built around a glorious 12th century cathedral (live webcam | tour | history) that was voted Britain's favorite building. 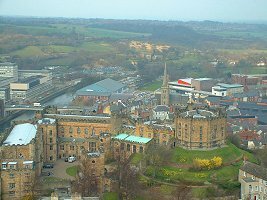 The cathedral and castle sit on a promontory that is surrounded on three sides by the river Wear. 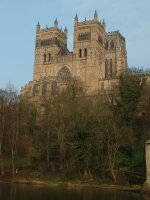 Rob is studying at the University of Durham, which is located at the center of the city. It was founded in 1832, is the third oldest English university, and has a collegiate system like Cambridge and Oxford. Rob belongs to St. John's College. On top of the promontory, Palace Green lies on one side of the cathedral. The Department of Theology is located in a Georgian building on one side of the green.